Hello guys, your rearing lamb having a problem? let’s check 20 Potential Health Problems in Rearing Lambs. Lambs are susceptible to contracting arthritis of bacterial origin, the most common Erysipelothix rhusiopathiae. Two days after infection the joints become hot, swollen and painful. It is possible to treat this pathology with large doses of antibiotic but it is highly recommended that its combat is through prevention. The animals are most vulnerable immediately after birth, tail cutting, castration and/or during shearing if they are left with wounds resulting from this operation. This infection occurs occasionally in lambs especially between the 2nd and 4th week of life. Symptoms include hunger, depression, low and stiff head and inability to follow your mother. It is very rare to succeed in treating this pathology and lambs that have not drunk colostrum are the most susceptible. 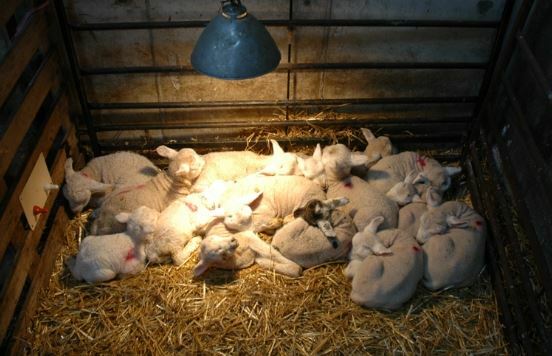 Border disease is caused by a virus and affects newborn lambs. They tremble uncontrollably and are very wooly. They usually do not survive and are often rejected by the sheep. Usually, the cause is the entry of animal carriers into the herd, so if the herd is closed this disease does not occur. There is no treatment. There are some cases of enterotoxemia caused by a bacterial infection. These bacteria live on the soil or in the intestines of healthy animals. C-type enterotoxemia infects very young animals causing bleeding in the small intestine, infection usually occurs following food changes. Treatment is not very effective and vaccination is the best way to prevent this disease. Type C is one of the most common diseases in sheep. It occurs in sheep that have eaten too much and too fast causing a very rapid proliferation of bacteria in their intestines causing a very dangerous infection. The best way to prevent this disease is by vaccinating the animals. It is also important to monitor the amount that lambs ingest, especially in the first month of life to prevent overfeeding. Adult sheep are susceptible to copper toxicity, on the other hand, because of their low milk content the lambs are likely to suffer from lack of copper. If they have this deficiency they showed signs like difficulty in walking or of being kept in season. It is easily corrected by administering a supplement rich in copper or copper sulfate to lambs. When faced with a case of diarrhea it is crucial to realize what is causing it since it is not a disease in itself but a sign of disease. Among the possible causes are infections, eating disorders and stress. Stool testing may be critical to discover the causative agent of diarrhea. It is vital to include your veterinarian in solving this problem. To minimize losses it is important to prevent dehydration by administering fluids and electrolytes. Diarrhea caused by E. coli Diarrhea caused by E. coli is very common in very young lambs living in environments with poor hygiene. As a treatment, fluid therapy and antibiotics are recommended but it is highly recommended to invest in prevention. Goiter is caused by the enlarged thyroid gland that is located in the neck region. When lambs are born with this pathology they usually have no wool and are weak at risk of starvation. If the goiter is not very advanced, it is possible that the goat will survive. It is caused by a deficiency in iodine in sheep feed and so as prevention, it is recommended that it be added to the diet of pregnant ewes iodized salt. It is a highly contagious viral infection that causes painful pustules around the mouth of the Borrego, is self-limiting and tends to pass in a few weeks. There are vaccines that help prevent infection. It is a bacterial infection that occurs in lambs in the spring when they are in the grassy grass with high and always wet. The affected animals suffer from severe claudication and it is possible to treat them with antibiotic spray. If it is a disease that is spread by the herd it is possible to treat with footbaths. Hypothermia is a common cause of death in very young lambs. As they are not able to regulate their body temperature in the first day and a half of life they cool easily and can die if their body temperature goes down from 36.6ºC, so it is essential to keep them warm. To avoid economic losses related to lamb mortality it is advised to keep them in sheltered and warm areas. Young animals are susceptible to acidosis, caused by a decrease in blood pH due to overfeeding of foods rich in easily fermentable carbohydrates. If it is not corrected it can be lethal. Affected lambs may be lethargic, have diarrhea and possibly fever. To treat acidosis you can use alkalinizers such as baking soda. parasites The most common parasites in young animals are coccidia and cryptosporidium. Cryptosporidium causes depression and diarrhea, which can lead to death from dehydration and hypothermia. Fluid therapy and maintaining proper body temperature is critical to the success of therapy. Coccidiosis tends to arise during the stress of weaning, causes changes in the small intestine which in turn leads to malabsorption diarrhea. There is treatment but it is better to prevent the appearance with good hygiene measures. are inflammations and infections of the navel, these infections act as gateways of infectious agents into the bloodstream which in turn can give rise to arthritis. Baboons with omphalitis have a swollen and painful navel region, and when they additionally suffer from arthritis, they claudicate and the joints are also swollen, hot, and painful. These conditions can be treated with penicillin or another antibiotic from the same family but can also be prevented with a good disinfection of the navel after delivery. Tinea is caused by a fungal infection of the skin. The infection can pass from one sheep to another through shearing. The lesions are mostly found on the head, neck, and back. It can be treated with fungicides and is zoonotic. The lambs are very susceptible to pneumonia, especially when there is poor ventilation in the facilities where they are or sudden changes in the weather. It is mostly fatal and even after treatment the animals have pulmonary sequelae and may later have a relapse. Clinical signs include dyspnoea, runny nose, and fever. The best way to prevent this pathology is to create good ventilation conditions and clean environments. Scrapie is a disease that affects the central nervous system. It has no treatment and is always fatal. It is caused by a prion. Clinical signs include apparent severe pruritus, gait changes, and seizures. The mechanisms of transmission are not completely understood and recent studies point to the possibility of transmission through urine and the prion can resist in the environment for decades. There also appears to be the possibility of transmission at delivery and through contact with the placenta. The first signs appear between three and five years of age. It’s not zoonotic. It is caused by deficiencies in vitamin E and/or selenium and causes degenerative changes in the skeletal and cardiac muscles. The hind limbs become rigid, arched back, and abdomen retracted. It may be treated with parenteral administration of vitamin E or selenium. As a form of prevention, it is necessary to provide sheep and lamb with adequate amounts of these nutrients. It is a homozygous recessive disease that causes changes in the development of cartilage and bone of sheep. It is most common in Suffolk and Hampshire. Affected animals are born with deformities in the limbs and are unable to stand upright. When buying animals for your herd you should have to buy animals that are free of the gene that causes the disease. What is the Difference between Lamb and Sheep? Previous post What Bird Chirps in the Middle of the Night? Next post How am I Supposed to Feed My Fish?